Includes the upgraded Professional Hard Hat Compatible Headphones, Belt Pack, the powerful Burst Tone Sound Generator and large carry case. Featuring GooseNeck Probe. The AccuTrak® VPE-GN Pro-Plus Kit is our most comprehensive VPE-GN Kit, for the serious technician who needs the maximum capability from an ultrasonic instrument with a GooseNeck. With the sensor at the end of the 9-1/2” long flexible GooseNeck you get full sensitivity all the way into those hard-to-reach places. The VPE-GN Pro-Plus Kit includes the upgraded professional Noise Cancelling Headphones, a convenient Belt Pack, PLUS the powerful Burst Tone Sound Generator, in the larger case to keep everything together. The VPE-GN Pro-Plus Kit offers unrivaled functionality and versatility for a fraction of the cost of any competitive system with similar performance. Find any kind of leak, in any environment, find bad gaskets and door seals – and do it all well, in hard-to-reach places you can’t even see! 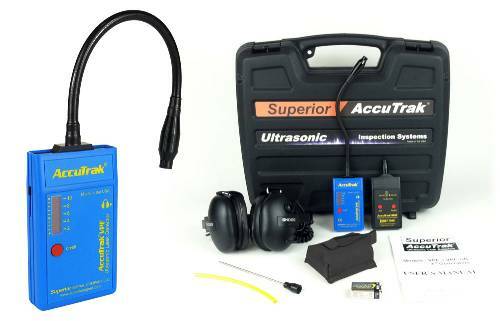 If you do a variety of work, and need a cost effective professional kit that can do it all, the Superior AccuTrak® VPE-GN Pro-Plus Kit is for you.